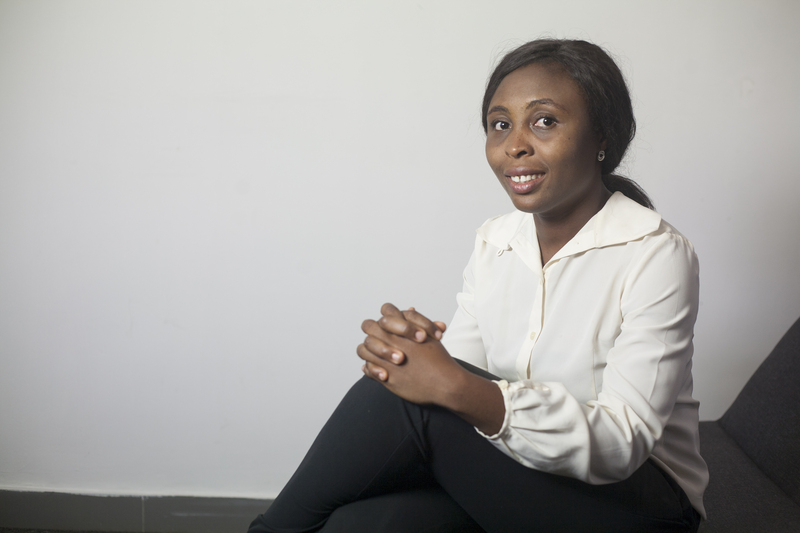 How accepting is Nigeria’s hemisphere of the principles and pragmatism of gender inclusion? Nigeria ranks 114 out of 130 economies in the Global Human Capital Index for 2017 by the World Economic Forum. 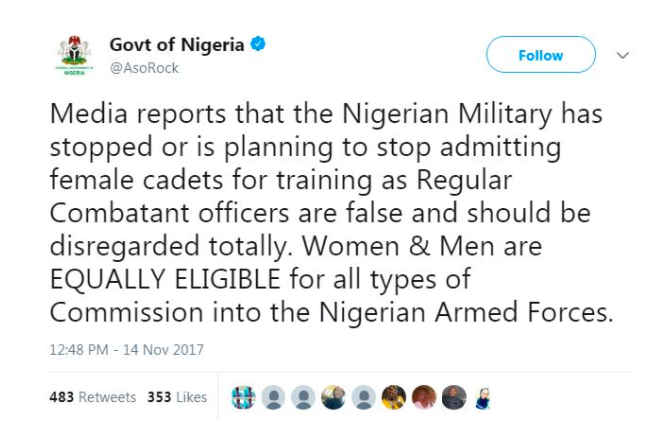 As it is, Nigeria is failing to harness her human capital, and the recent motion by the Nigerian Military to end the admission of female cadets into the combatant course of the Nigerian Defense Academy is a setback. Gender inequality directly violates the fundamental human rights of the Nigerian woman as they are less recognized compared to their male counterparts. Although historical trends from various cultures suggest women are as effective in direct combats, their achievements are often suppressed by the military hierarchy. Despite the roles of great women as the Queen Amina of Zaria, Queen Idia of the Benin Kingdom and others, the Nigerian military wants to phase out the training of female regular combatant cadet. You might find it interesting to note that only the Regular Combatant Commission allows for career growth and provides the opportunity to head any of the services up to the ranking of the Chief of Defense Staff. Nigeria cannot continue to underestimate the role women play in advancing our national interests and our country’s goals of peace, stability, and prosperity. We recognize that what makes us diverse, makes us strong and no Nation can get ahead if about half their populations are left behind. If Nigeria truly supports the Sustainable Development Goals, then gender equality should govern not only the ranks of our defense service but our philosophy to advance true equality and equity around the globe. For both women’s and men’s needs and priorities to be addressed adequately in society, both must be involved and represented in the decision-making process, in policy creation and its implementation. This holds true in the security sector as well.Increased inclusion of females is beneficial for the Nigerian security sector, as diversity makes armed forces more effective. These benefits are particularly important when National armies take part in peacekeeping and peacebuilding missions abroad. Gender equality is important to be able to view conflict and military operations through a gender lens and to analyze how women are impacted by conflict. This may lead to a change in tactics to limit the negative consequences for women and children. The Nigeria Armed Forces confine women’s career path as female officers who were admitted into the Regular Combat Commission are restricted to non-combat duties thereby limiting their career path irrespective of their competence or skills. According to the Punch Newspapers, In 2010, Former President Goodluck Jonathan had ordered the Military to allow females interested in becoming Combatant Officers of the Nigerian Armed forces to be admitted into the Nigeria Defense Academy (NDA) for the first time. The first set of twenty Females nicknamed “Jonathan Queens” were first admitted into the course in Goodluck Jonathan administration in 2011. In Nigeria, some female officers have distinguished themselves in the Armed forces, the first set of female cadets graduated from the Academy in 2016, and three women bagged awards including the Navy Gold award, the best in the Navy category. A female Cadet C. Lord Mallam won the Navy Gold award, the most regarded award in this category. Also, the second highest Army Silver award went to a female cadet, K. O Dayo Karim and the Air Force Silver Award was bagged by a female Cadet O.S Ijelu. On the 14th of November 2017, The Federal Government of Nigeria through its twitter handle said it was a false news. 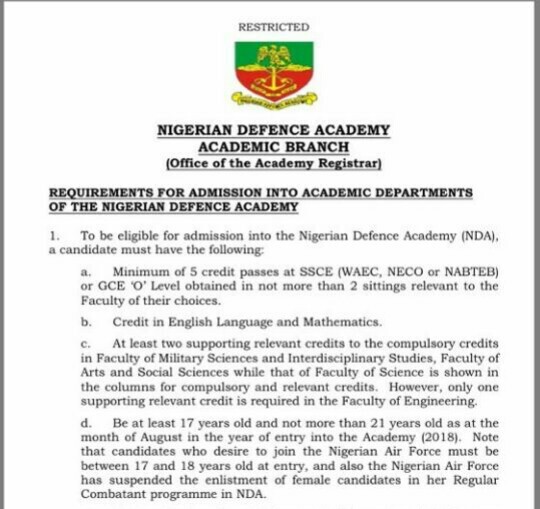 The requirements on the Nigeria Defence Academy website conflicts the denial. Todays reports from Nigeria Tribune Newspaper Wednesday, November 22nd, 2017 raised the issue that in the Federal House of Representatives; a lawmaker from Edo State, Honourable Gabriella Omosede Igbinedion moved a motion: “call to halt the proposed plan to stop admission of combatant female cadets into the Nigerian Defence Academy”. Her intervention made the House to call for increase number of female combatant cadets, and as well urged the Armed Forces Council and the Federal Ministry of Defence to halt the plan to stop admission of combatant female cadets into the Nigerian Defence Academy. The House further mandated the committees on Defence, Army, Navy and Airforce to investigate the matter and report back in four weeks for further legislative action. It is imperative to note that adding Women to combat units and a gender perspective to military operations more generally has the potential to add new capabilities and thereby also improve the effectiveness of operations. Every year, tens of thousands of women and girls are victims of human trafficking, sexual exploitation, violence, extremism, etc. Women in our hemisphere overwhelmingly bear the burden of insecurity and instability which means they must be a large part of the solution. Every Nigerian irrespective of gender should be given equal opportunity to excel in their chosen field of life and contribute to the development of our Nation. If a woman wishes to serve her country and pass the test, she should be allowed to with no exceptions and granted every opportunity that a man is offered. Equal opportunity is more than just lip service or filling a quota in today’s security environment; it is a strategic imperative. Nigeria must continue to strive to advance the principles of women in peace and security. 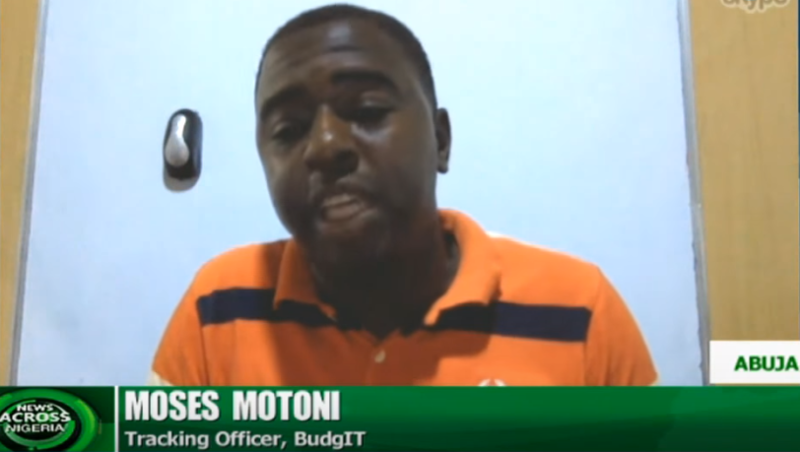 Watch Moses Motoni on “ChannelsTV” | How Nigeria Police arrested, chained BudgIT staff for monitoring Constituency Projects. 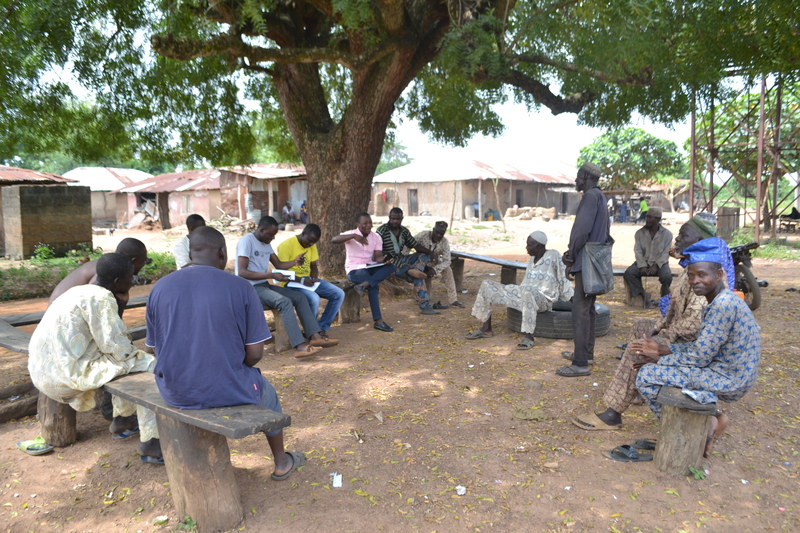 Forty Years without Electricity: Olorunda Community in Oyo State cries out.